For over two years, the posting site known as Blogspot.com has hosted a blog identified as the "story" of one Ilya Beyzin, (using the alias "Alhimik"), who claims that his father suffered and died because at some point during his battle with melanoma, he decided to try "LIESH," the laser therapy offered by a small company called Lase Med Inc., run by a physicist named Dr. Antonella Carpenter; and because he "believed" what Dr. Carpenter told him. 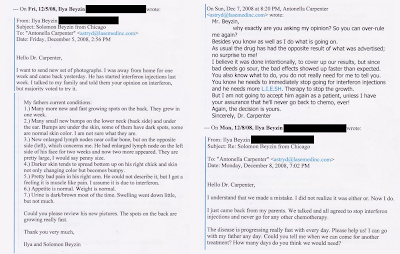 "I would like to share our awful experience with Antonella Carpenter and Lase Med Inc - I am hoping this would help others to avoid mistakes we have made." Ilya's father had battled melanoma for a long time, undergoing multiple surgeries, repeated rounds of chemotherapy and radiation; and after standard methods had miserably failed, he resorted to alternative methods, looking into "natural" remedies. Without spinning off into a tangent discussion on how valid such remedies might be, the reality in this case is that the use of deadly oleander had made the melanoma spread like wild fire and had left the patient without hope . Eventually the author of this hate-blog found Lase Med Inc’s website and decided to bring his father to their Treatment Center as a last resort. 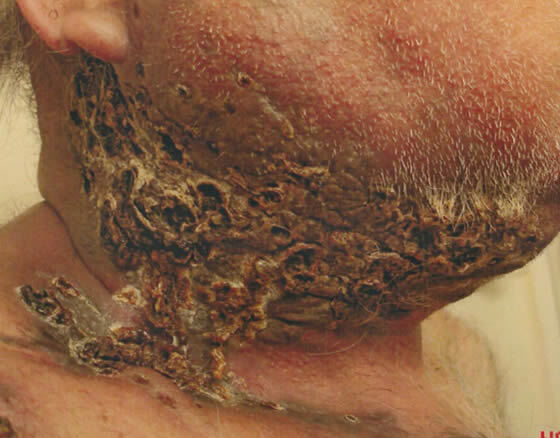 The outcome was that the therapy in question halted the melanoma in its tracks; and over the weeks following the treatment, obvious signs of healing started to become evident. 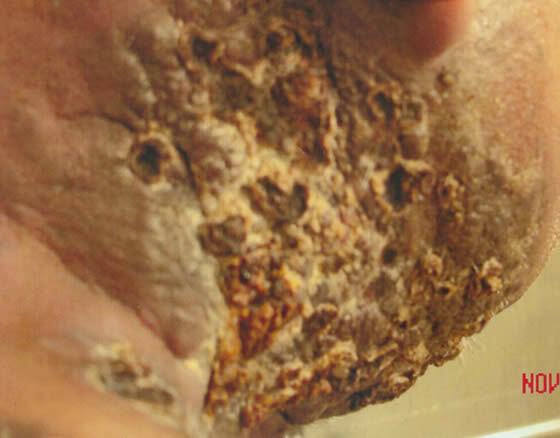 Two weeks after LIESH therapy, Nov 9, 2008; still drying up more, now with visible necrosis and visible signs of decomposition of dead tumor mass. A little over three weeks following LIESH therapy, Nov 17, 2008; healing continues, and more advanced necrosis and decomposition of dead tumor mass is clearly visible. 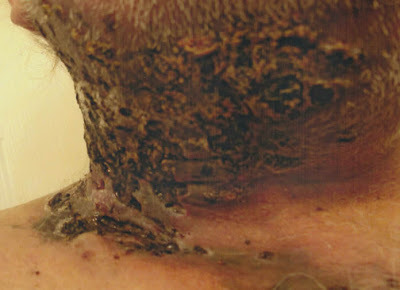 The pictures shown above prove how the extensive malignant growths were all dried up, only a week following the treatment; furthermore, within a few weeks the signs of necrosis were becoming more and more evident. Everything was progressing beautifully as expected, but then an e-mail was received, indicating that the condition of the patient had worsened, following infusions of Interferon. The exchange of e-mails shown above gives a clear proof of the events. According to the attacker Alhimik, the family, against LMI’s advice, decided to resume some form of chemo (in this case Interferon), and in this way generated a rebirth of the melanoma. The patient was reluctantly accepted for additional LIESH treatment, but all the sessions could not be completed, because the overseeing physician was exposed to be a mole and fired. At that point Dr. Carpenter had no choice but to move operations to a state friendlier to alternative practitioners. This melanoma patient was instructed to make a new appointment, and to come as quickly as possible to the new facility for the remaining sessions. He did not. Afterward, the hate blogger started to attack Lase Med Inc. and its CEO, blaming them for the death of his father, by claiming that he didn’t have any more chemotherapy after receiving LMI’s LIESH therapy, and insisting that Interferon is not a chemotherapy drug. "Her response was about her not able to counter the bad results of chemo… and she supposedly told me so, but what chemo was she referring to? Based on her logic the two interferon muscle injections in November 08 (she kept on calling them chemo) killed my father in February 09." Interferon is a chemotherapy drug. (See above photo). Ilya Beyzin, alias "Alhimik," continued to post slanderous blogs and misinformation about Lase Med Inc. and Dr. Carpenter in order to destroy the business, out of misplaced hate and rage. However, every time a member of the Lase Med Inc. team tries to identify him and expose his lies, he goes on a vengeance spree and files all kinds of complaints, because he does not want to be identified by his real name (in spite of the fact that he does exactly that against the organization and the people he wishes to destroy). Two weeks ago Dr. Carpenter had enough of his and his cohorts’ collective slander, which for some strange reason is still showing up on the top of web searches in spite of numerous new positive patient-owned blogs having been recently posted; as a result a new video (Truth Rises to the Top, Part 2) was posted on our YouTube channel, with the actual facts of the case and relative written evidence, the pictures shown here, the exchange of e-mails, plus a web posting made by Ilya Beyzin himself on a third-party blog site, verifying the patient’s use of the deadly oleander. As expected, the video, carrying tangible evidence of the truth, produced an uproar in the enemy camp, and a rush of "privacy infringement flags" from YouTube, followed by re-releases of increasingly "censored" versions of both part one and part two of "Truth Rises to the Top." An exchange of counter-complaints and submission of evidence on who is actually violating individuals' rights is still ongoing, and the LMI Team has no idea of when and how it will end. So far what is emerging is that our presenting the truth has been labeled by at least one video hosting site as "disrespectful and disruptive;" but lies, intended to slander Dr. Carpenter and to deceive the public at large are absolutely fine. For all the above reasons, we decided to post this blog on the very same blog host used by this Ilya Beyzin character, so that the truth can finally be known through the presentation of hard evidence. This is finally being done after two years of online attacks, because no human being should be subjected to such a barrage of lies in order to serve some special interest, with total disregard not only for what is honest and good in this world, but also with complete disregard for human life and suffering. How else could we describe lies that cover up the truth and mislead the uninformed on the existence of a cancer treatment that can save people from unnecessary mutilation, poisoning, radiation damage, and death?